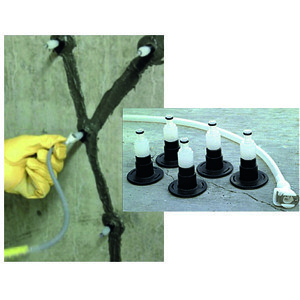 Simpson Strong-Tie’s ETI Injection Epoxies are specially designed formulations for the injection of cracks in concrete. 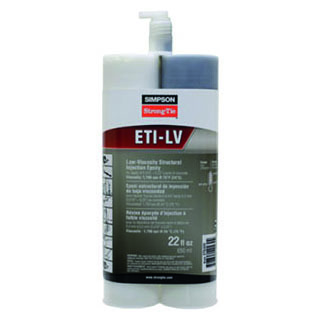 ETI epoxies are two-component, 1:1 ratio, 100% epoxy solids formulations. 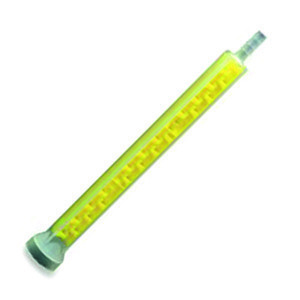 They are available in 22 ounce side-by-side cartridges and are dispensed through a static mixing nozzle using a manual or pneumatic dispensing tool. ETI is available in two viscosities: ETI-LV (low viscosity) and ETI-GV (gel viscosity) to handle a wide range of crack widths. Properly applied, they provide a repair that is both waterproof and high strength (structural).